I’ve always said that one of the most difficult jobs of the war was that of the Confederate ordnance officer. It was not unusual, especially early in the war, to have units armed with two or even three different types and calibers of weapons. Even when things more or less standardized (at least In Virginia) with the .577 Enfield, there was still special ammunition to consider. 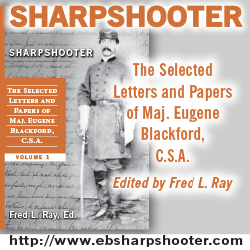 A sharpshooter of Mahone’s brigade, for instance, said that “the battalion was armed with long-range, small-bore Enfield rifles, and used a long English-made cartridge. We never used any ammunition made by the Confederate Government.” What exactly was he talking about? The British Army used the Pritchett bullet, which was similar to the Minie ball but had some important differences. Although it shared the expanding base it also used a paper patch to aid sealing, and was a good bit longer (as can be seen in the illustration below), which gave it a better aspect ratio. I will have a more detailed post later, but suffice it to say for now that it was manufactured with greater precision and had better powder, all of which made for noticeably better accuracy. 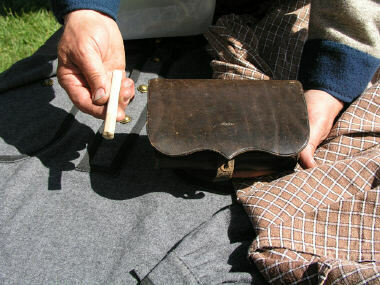 This was what the sharpshooters got, and of course since the cartridge was longer it would not fit into the standard ammo pouch, so a deeper pouch had to be issued to them. Here Bill Adams (a font of knowledge on matter such as this) shows off one of these pouches, along with examples of each type of cartridge, at a recent N-SSA event. The Whitworth cartridge was even longer, and came in a handy cardboard tube. To load, the shooter just pulled the paper tab, which dumped the powder down the bore, then inserted the hexagonal bullet and rammed it home, as shown below. 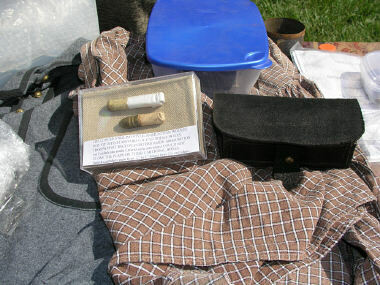 The extra long Whitworth cartridges required an even deeper pouch, shown here (again courtesy of Bill Adams) with a tube. Previous post: Execution of Sharpshooters?